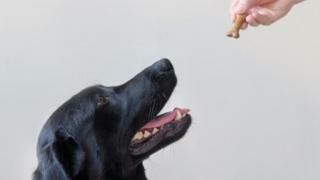 Image caption Could a genetic mutation explain some dogs' insatiable appetite? When it comes to man's best friend, science may finally have solved the mystery of their gluttony - some Labradors, it seems, are genetically predisposed to being hungry. That's according to scientists who were discussing their ongoing mission to improve our favourite pets' health at the British Science Association Festival in Brighton. Several research teams in the UK are on a mission to improve canine health. Researchers at the University of Cambridge have studied the appetite of Britain's favourite dog breed, and suggest Labradors are genetically at risk of becoming overweight. Roughly a quarter of British households own a pet dog, and Labrador retrievers remain our most popular canine companion. However, this stereotypically "greedy" breed often suffers size-related health problems. "Obesity is a serious issue for our dog population," says Dr Eleanor Raffan from the Wellcome Trust-MRC Institute of Metabolic Science. "It has the potential to have a massive impact on pet welfare." In research supported by the Dogs Trust, Dr Raffan and her colleagues have analysed DNA from the saliva of Labradors across the UK. They found that particularly greedy individuals possess a gene mutation responsible for increasing their appetite. "We found around a quarter of pet Labradors have at least one copy of this mutation in the gene," Dr Raffan explains. Their increased appetite manifests itself as a "food obsession", familiar to dog-owners as begging or scavenging for food. In the past, the onus has been on owners to restrict the diet of their pets to prevent excessive weight gain. But Dr Raffan's research suggests the propensity for large appetites, and hence potential obesity, is hardwired into some individuals. "We hope to shift the paradigm away from owner-blaming" says Dr Raffan. "It's a bit more nuanced than just owners needing to be careful." Dr Raffan cautions against any attempt to breed this "greedy mutation" out of Labrador lines. While it might predispose the dogs to obesity, a strong focus on food may also explain why Labradors are so easy to train and are such loyal human companions. "If we try to get rid of the mutation, we might find we change the personality of the breed, and that would be a real shame," she explains. Yet their results raise an ethical conundrum. Owners and veterinary surgeons are responsible for providing five core so-called freedoms to animals in their care, including freedom from pain and disease, and freedom from hunger. Obesity is a disease, and negatively impacts upon canine quality of life. "But equally, being hungry is a welfare issue," says Dr Raffan. "And these dogs are genetically hungry." Dr Raffan hopes future research will improve the satiety of their diets, allowing a feeling of "fullness" without the potential for excessive weight gain. Being overweight undoubtedly reduces a dog's quality of life, and can also affect their ability to cope with arthritis and other underlying joint disorders. At the University of Liverpool, scientists are using state-of-the-art imaging technology to study diseases affecting the knee joints of Labradors. "We're trying to understand how the shape of the Labrador body and the way they walk might contribute to knee problems," says Prof Eithne Comerford, a specialist in musculoskeletal biology. Using high-speed x-ray cameras, the researchers film their canine patients walking through the lab, and watch their knee bones slide and twist in real-time. The team hopes to understand how walking contributes to the risk of ligament injury and rupture in Labradors, with the ultimate goal of reducing lameness and suffering within the breed. "This data will also help veterinary surgeons and engineers design better treatments for ligament damage in Labradors, like customised knee implants," explains biomechanist Dr Karl Bates from the University of Liverpool. Both research groups rely heavily on the good will of Labrador owners, both for collecting samples and entering their pets into experimental trials. In addition to tackling diagnosed health issues, researchers hope to change the public's perception of what "desirable" traits should characterise our favourite breeds. "There is a real danger when we breed dogs to be cuddlier and cuter," warns Dr Raffan. "I think people have seen so many overweight Labradors, they start to assume it's normal".